On the morning of July 11, hundreds of angry residents from working class colonies in Anand Parbat/Baljeet Nagar area, as well as activists from Krantikari Yuva Sangathan (KYS), Workers Unity Centre (WUCI), Anand Parbat Udhyogik Mazdoor Samiti, Centre for Struggling Women (CSW), etc., took out a rally which culminated at Shadipur Depot. 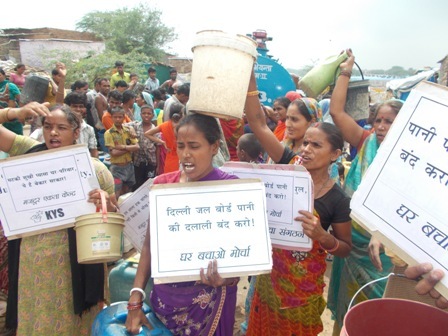 The residents were protesting against the erratic and unequal distribution of water by the Delhi Jal Board (DJB) across the city of Delhi. The agitating residents strongly believe that the brunt of this unequal distribution of water is borne by the city’s poor who reside in colonies which are supplied water not through pipelines but through tankers. After sloganeering against the DJB, a delegation submitted a Memorandum to the DJB. The delegation pressed for the following: (i) water supply to households in the entire Anand Parbat/Baljeet Nagar through pipelines; (ii) provision of 120 litres per person per day; (iii) provision of a larger number of tankers, as well as a greater frequency of tankers every week; (iv) provision of free and bribe-free water supply via tankers; and (v) immediate implementation of rain-water harvesting, boring and other effective projects to meet the residents’ needs. There are over one lakh residents living in the affected area, i.e. in colonies like Prem Nagar, Nehru Nagar, Tali Dera, Chetan Basti, Punjabi Basti, Gulshan Chowk, etc., with some 20,000 belonging to the two large slums located in this area. Despite the density of the population, it seems that because the residents share a predominantly working class background, the Delhi Jal Board (DJB) has never considered supplying water through pipelines to this area. Water is instead supplied to the area via water tankers. Earlier, these tankers used to provide water to the said colonies on alternative days. However, off late the tankers have become so erratic that at many water supply points they come barely once a week. Neither does the DJB invest in rain water harvesting, or pursue other projects to meet the needs of these residents. In addition to this, the privatization of water supply in the city is also reflected in the recent scams involving water treatment plants like the tender for Bhagirathi Plant where irregularities amounting to 200 crores were reported. Clearly, when issuing tenders involving water projects, the interests of private players play a significant role. Due to their involvement in such water supply and distribution projects, private contractors have now come to determine the quality of the water treated, as well as time taken to put such projects in place. Furthermore, under the influence of neo-liberal economic policies which press for privatization of the social sector (i.e. education, healthcare, etc.) as well as natural resources, successive governments have even sold water reservoirs and other water bodies at throwaway prices to private companies. Such private companies are either interested in the business of packaged water, or, desire direct access to a water source for their manufacturing plants. Private players have, hence, firmly wedged themselves in numerous ways between Delhi-ites need for water and water itself. The impact of this growing privatization of water supply is most clearly reflected in the creation of an artificial water shortage in the city. On one hand, wealthy residential areas in the city like Jor Bagh, Sundernagar, Sainik Farms, etc. receive uninterrupted supply of water amounting to 450 litres per person per day, and on the other hand, nearly 50 lakh people in the city survive on just 40 litres per person per day. Similarly, it is difficult to uphold the theory of Delhi’s acute water shortage when big hotels, water/adventure parks, etc. enjoy generous supply of water. “If there is always plenty of water for some and never enough for the majority, then we are dealing with a biased policy approach and not an ecological problem,” asserted Sujit Kumar from KYS. Before dispersing the protesting residents resolved to intensify their struggle, and to launch a larger public campaign across Delhi’s working class areas.